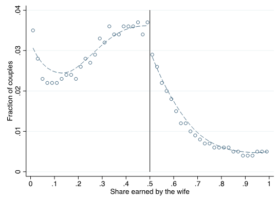 New research by Natalia Zinovyeva and Maryna Tverdostup examines why there are many more couples where the husband slightly out-earns his wife than the other way around. While previous research has attributed this discontinuity to the existence of a ‘gender identity norm’ that limits the income of married women, their study shows that, paradoxically, it is the result of a phenomenon – co-working couples – that tends to equalise a couple’s earnings and helps women to earn more. The research, to be presented at the Royal Economic Society's annual conference at the University of Warwick in April 2019, analyses data from Finland where 15% of working couples work together. 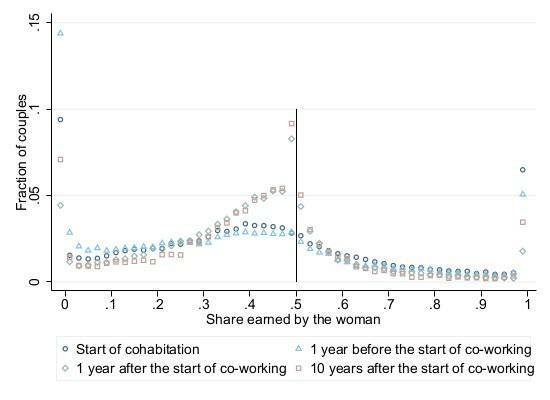 It reveals that immediately after spouses start working together, household earnings tend to converge, both in couples where women initially out-earned their partners and in couples where women were the second earners. According to the World Value Survey, 36% of Americans agree with the statement ‘if a women earns more money than her husband, it’s almost certain to cause problems’. In the European Union, this view is shared by 39% of the population. Even in places like Finland, 33.9% agree with this view. In an influential article, Marianne Bertrand and colleagues (2015) point out that a social norm that assigns a breadwinner role to the husband may put women with high-earning potential at a disadvantage. It may affect the formation of couples and it can induce high-earning married women to reduce their labour supply. 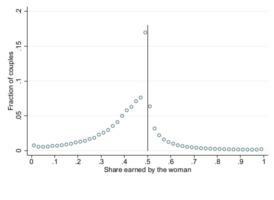 Analysing US data, Bertrand et al argue that this gender identity norm explains why there is a discontinuity to the right of 0.5 in the distribution of married couples according to the share of income earned by the wife – see panel (a) of Figure 1. The existence of this discontinuity has been widely cited both in the media and in academia. Sources: SIPP Complete Gold Standard Files 1990-2004, Panel (a); and FLEED 1988-2014, Panel (b). The new study revisits the analysis by Bertrand et al using exceptionally rich data from Finland. It shows that there is a similar discontinuity among Finnish households – panel (b) in Figure 1. But the Finnish data makes it possible to examine some additional patterns that cast doubts on the gender identity norm explanation for the discontinuity. The discontinuity only arises within a very specific group of couples: spouses who start working together (see Figure 2). This group includes around 15% of working couples. In the rest of the population, there is no evidence of any unusual phenomena in the vicinity of the 0.5 point. The discontinuity does not exist when couples are formed. It emerges over time as a result of the earnings convergence and equalisation among co-working spouses. 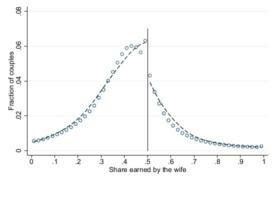 As Figure 3 shows, immediately after spouses start working together, household earnings tend to converge, both in couples where women initially out-earned their partners and in couples where women were the second earners. Given that the former group is larger, the process of convergence generates an excess mass of households to the left of point 0.5 and, in a fraction of co-working couples, earnings completely equalise. The authors hypothesise that there may be several reasons explaining why co-working couples tend to equalise their earnings. If they are eventually going to pool their income, it would be unnecessary to negotiate different salaries. Moreover, self-employed couples may be inclined to report similar earnings to minimise the tax burden. Beside fiscal incentives, the legal environment may provide incentives for equal income sharing in firms with certain legal forms. 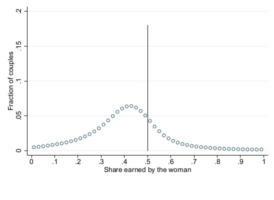 Finally, if spouses decide to work in the same firm, the existence of wage scales at the firm (or even sectoral) level may also increase the likelihood that both spouses receive identical earnings. The authors observe that women co-working with their partners on average tend to have higher earnings than similar women in other couples. Overall, the evidence suggests that the observed discontinuity is not due to the existence of a social norm that limits the income of married women. Paradoxically, the observed discontinuity is the result of a phenomenon – co-working couples – that helps women to have higher earnings. Bertrand, Marianne, Emir Kamenica and Jessica Pan (2015) ‘Gender Identity Norms and Relative Income within Households’, Quarterly Journal of Economics 130(2): 571-614. FLEED (2015) Finnish Linked Employer-Employee Data, Statistics Finland. US Census Bureau (2015) SIPP Synthetic Beta: Version 6.0, Washington DC; Cornell University, Synthetic Data Server, Ithaca, NY. World Value Survey 1995-1998, available at www.worldvaluessurvey.org. Zinovyeva, Natalia, and Maryna Tverdostup (2018) ‘Gender Identity, Co-Working Spouses and Relative Income Within Households’, IZA discussion paper 11757.